Keeping up with heavy snowfall is no problem for us. 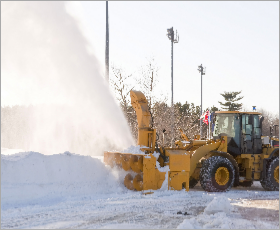 You can count on us to keep your parking lot cleared and safe all winter long. Contact us for a competitive quote. Our top-notch equipment allows us to get through even the toughest snow storms. You can trust us for dependable snow removal services so your guests will never have to tackle dangerous conditions. When the winter weather starts to hit, you will be happy you trusted us to take care of your snow removal. We have the right equipment to take on the big job of keeping your parking lot and private roads cleared of snow. No matter what time the snow starts falling, we will work around the clock to get the job done. This includes making multiple passes on your parking lot during bigger storms, keeping it clear of snow so your customers can safely go to and from their vehicles. Whether you just want us to clear the snow away, or take it to the next level and also salt and sand is up to you. We have access to enough salt and sand to keep even the largest parking lots clear all winter long.